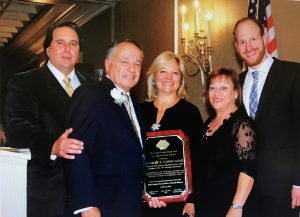 Bob Cassiliano President & CEO of BIZ and Chairman and CEO of 7×24 Exchange International receives Business Leadership & Entrepreneurship Award | Business Information Services, Inc. Eight southwest Brooklyn mainstays were in the spotlight as the NIA Community Services Network honored local educators, businesspeople and civic leaders at its 18th annual Community Recognition Awards Dinner. The Man of the Year was Dennis Diggins, first deputy commissioner of the city’s Department of Sanitation. Maria Timo, principal of Bay Academy, was presented with the Educational Leadership and Collaboration Award. Louis Coluccio, Jr., the proprietor of A.L.C. Italian Grocery, was given the Business Achievement & Community Service Award. Inspector Frank Cangiarella, who currently is assigned to the NYPD’s Patrol Borough Brooklyn South, was honored with the Exemplary Leadership in Public Service & Law Enforcement Award. Robert Cassiliano, the president and CEO of Business Information Services and chair and CEO of 7X24 Exchange International, was given the Business Leadership & Entrepreneurship Award. Liset Isaac, principal of P.S./I.S. 192, received the Educational Leadership & Collaboration Award. Alyson Silver, seventh grade dean of discipline at J.H.S. 227, received the Community Leadership & Collaboration Award, and, finally, Brian Tullo, USA Local 831 shop steward, DSNY, received the Humanitarian Award. The event was held on Thursday, October 6 at Gargiulo’s, 2911 West 15th Street. Founded August 1997 has a management and operating philosophy focused on business partnerships and long-term relationships. Integrity, Trust, Responsibility, Performance, Reputation, and Relationships are corporate values that are the cornerstones of the company’s foundation. Every action the company, its employees or its contractors take must be taken with strict adherence to these corporate values. Therefore, as an example, BIZ will not accept or participate in short term business that jeopardizes long-term relationships. Our clients have a mode of operation based on trusted relationships. Firms want to work with service providers who value long-term relationships and prefer not to work with transaction driven service providers. Companies are attracted to service providers who demonstrate sustained performance not just one time successes. BIZ provides technology services for many of the world’s leading organizations including fortune 500 companies. The services are very focused with emphasis on providing expert resources for a particular assignment. The company hires employees or contracts consultants with skills that are specifically targeted at providing clients with the best possible service for the project. BIZ seeks to provide superior talent to clients to support infrastructure services, application services, corporate relocations, managed services, business/disaster recovery services and cyber security. BIZ staffing services provides consultants to supplement client staff as well as permanent hires.